Excellent bouts of humor interspersed with searing moments of sadness keep you moving through the murk that is a world turned inside out. In his new novel, Smoke City, Keith Rosson takes you on an unbelievable journey, not just through physical impossibilities, but also through an emotional realities. Unlikeable characters are likeable, to the point where your heart breaks for them in their self-inflicted tragedies. Mostly, this story is about 3 men, all trying to make it to Los Angeles for varying reasons, annd mostly those reasons have to do with redemption and forgiveness. Mike Vale really hits you in the gut. His story is one we see over and over in the tabloids and on the news. We lament that celebrity ruined a person, and watch from afar while holding ourselves separate. But Rosson is able to write that tragedy in such a way that it breathes new life into it because he is able to drag you into the demise. You feel the loss and the despair, the hope, and the pain of defeat. And you keep hoping, just like everybody around him, that Mike will find his redemption…that he will be saved from himself and his addictions. Marvin is more likeable, but still seems to be a rather frustrated and sad man, resigned to his fate of never being able to move on from this plane. The snippets of his past lives and obvservations about them heading each chapter are amazingly well-done and lend credibility to what is a seriously incredible story. I started the story wondering if he was delusional, but ended it with the firm belief that he was not. Such is the power of the journey the men embark on. There is a lot of coincidence vs. divine intervention…or even The Curse, as Marvin calls it. So many things that seem minor come up again later, proving that nothing in this story can be discounted. Rosson makes a point to tie up almost all the loose ends. I wish I knew what happened to Candice. I wish I knew why the smokes started showing up when they did…and why it took so long for Marvin to find his purpose. The ending, however, was more than satisfactory. After the heaviness of the work, Rosson throws you a bone…one that is sorely needed. There isn’t a lot that I didn’t like about this book. Excellent bouts of humor interspersed with searing moments of sadness keep you moving through the murk that is a world turned inside out. As smokes become more and more frequent, it becomes more and more apparent that Marvin is linked to them, somehow. His roller coaster ride through hope, despair, and fear is something that must be experienced, if only because it is so very real. Rosson paints a very real picture of what it means to be flawed and still believe that you must have a purpose. If nothing else, read this because for the first time in a long time, I spent the last 15% of the book sobbing and laughing as the search the characters set themselves on culminates in sometimes surprising ways. I very highly recommend this book. Grab your copy by clicking the image below. 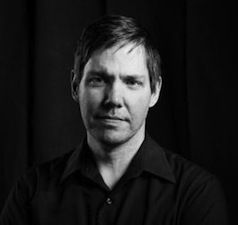 Keith Rosson is the author of the novels The Mercy of the Tide (2017, Meerkat Press) and Smoke City (2018, Meerkat Press). His short fiction has appeared in Cream City Review, PANK, Redivider, December, and more. An advocate of both public libraries and non-ironic adulation of the cassette tape, he can be found at keithrosson.com.